HF: Producing salt from the sea is one of the oldest industries in Hong Kong. I have information, however slight, that it was produced in at least these locations. 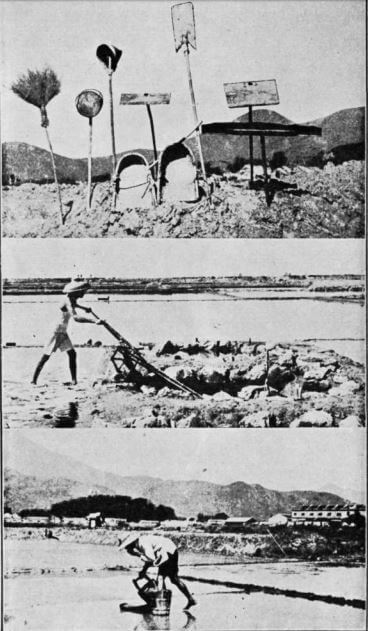 SY Lin wrote an article about Salt Manufacture in Hong Kong, which was published in the Journal of the Royal Asiatic Society Hong Kong Branch, Volume 7, 1967. However the Journal’s editor notes: This article, which is of considerable ethnographic and — nearly thirty years after — historical interest, first appeared in the pre-war publication The Hong Kong Naturalist (1930-41), Volume X, No. 1, January 1940. The original article says that when published salt was prepared from sea water in only three of the above-named locations ie Tai O, Shautaukok and San Hui. The article begins: In three places only is salt prepared from sea-water in the Colony namely at Tai O, a fishing village on Lantau island, Shataukok on the frontier in Starling Inlet and San Hui in Castle Peak Bay. Of these the first is the most important. The salt marsh at Tai O, which occupies an area of about 70 acres and is enclosed by high dykes to prevent flooding at high tide or by storms, is owned by three companies, two of which are slightly bigger than the third. The annual production in 1938 amounted to about 25,000 piculs (1,488 tons) valued at about $27,500. A small portion is consumed locally, chiefly by the fishermen in the salting of fish, and all the rest is exported. The companies lease the salines from Government and sub-let to individual salt-makers or hire them on a piece-wage basis in the form of shares in the profits. In the former case each saltfarmer leases a small saline of about \ to \ acre from the company, paying a rental of $2.00 per month, and endeavours to produce as much salt as possible from this limited area of land. The salt produced, however, must be sold to the company from which the saline has been leased. The company should be able to pay the farmer at a fixed price (50 cents per picul for 1938 – 1939), immediately on receiving the salt. On the average, a single farmer can harvest about 500 piculs of salt within a year. Most of the salt farmers of this type are natives of Lantau island and leaching is the only method inherited from their remote ancestors. 1. Some implements used in salt manufacture. 2. Raising brine from the storage tank into the evaporation ponds by means of an irrigation-wheel. 3. Pouring brine on the highest part of the crystalization-pond. See: It is worth looking at the Hong Kong Naturalist – “a quarterly illustrated journal principally for Hong Kong and South China” which was published from Jan 1930 until Feb 1941. Mainly articles naturally about the flora and fauna of HK but also on subjects of interest to us including, tea production, oysters, Kowloon waterworks, agriculture in the New Territory [sic] and a couple of mountains where mines are mentioned.